Monsey, NY - A Manhattan attorney representing a yeshiva student injured in a two car crash that killed another teen is calling out the Ramapo Police Department for intentionally downplaying charges in the case in order to protect the driver of the car, an off duty police officer. As previously reported on VIN News (http://bit.ly/2htbmJx), 17 year old Marcos Tawil died on September 7th when he was struck by a 2016 Lexus driven by 24 year old Jonathan Mosquera of Suffern, an officer with the Peekskill Police Department. A press release issued by the Ramapo Police Department on December 23rd said that Mosquera had been issued four summonses and that no drugs or alcohol were involved in the crash. David Maldonado of Monsey was standing with Tawil in the driveway of Yeshiva Tiferet Torah in Suffern when the collision occurred, and was critically injured in the crash. His lawyer, Herschel Kulefsky, alleged the Ramapo Police Department intentionally whitewashed the facts of the case to exonerate Mosquera. VIN News obtained a copy of the New York State incident report in which Sergeant Chris Youngman of the Ramapo Police Department said that Mosquera stated that he was on probation at the Peekskill Police Department when the accident occurred. In a formal statement given to police on September 13th, Mosquera said that he was due at work at midnight on the night of the accident but had overslept, calling in at approximately 11:30 PM to advise both the dispatcher and the midnight patrol officer that he would be late to work. While Mosquera told police that it normally took him 30 minutes to make the approximately 29 mile drive to work, all of the likely routes from Mosquera’s home to the Peekskill Police Department have speed limits that are less than 60 miles per hour. The fatal crash took place at 11:50 PM in a 50 mile per hour zone on Route 202, located just over 19 miles from the Peekskill Police Department, an approximately 25 minutes drive under normal conditions. Based on information obtained from Mosquera’s vehicle, police estimated that Mosquera was driving 64 miles per hour at the time of the collision. Mosquera also had Percocet in his car and a bottle of Hennessy cognac in the trunk of his vehicle, according to the accident reports. Police invetiagtors on the scene September 7th. Kulefsky said that police failed to charge Mosquera with passing a vehicle in a no passing zone and reckless driving, bringing the number of violations that should have been brought against Mosquera to six, instead of the four that were brought. The fact that Mosquera was only issued summonses and not charged criminally boggles the mind, said Kulefsky. Kulefsky said that despite statements in a release issued by the Ramapo Police Department saying that there was no evidence to indicate that drugs or alcohol played any part in the crash, at least one source at the accident scene reported that Mosquera’s breath smelled of alcohol, but that those concerns were reportedly brushed aside by officers at the scene. According to official accident reports, numerous officers stated the Mosquera did not appear to be intoxicated in any way, but there is no indication in the reports that any drug or alcohol tests were ever actually performed. 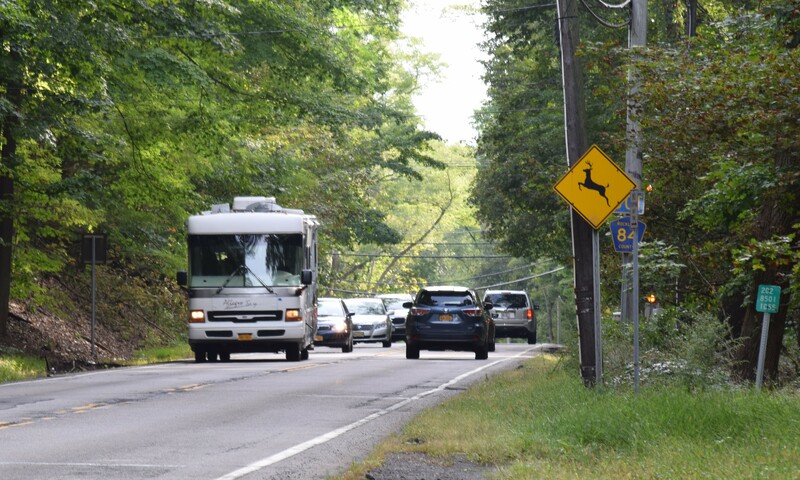 Additionally, while all fatal vehicular accidents are reviewed and possibly subject to hearing by the Department of Motor Vehicles, the Ramapo Police Department incorrectly reported the facts of the case to the agency, according to Kulefsky. Mosquera had worked for less than a year in Newburgh before coming to Peekskill last winter. The DMV schedule of fatal crash hearings which runs through the end of January does not currently include a listing for any accident involving Mosquera. Kulefsky called on Rockland County District Attorney Ken Zugibe to prosecute Mosquera for negligent vehicular homicide. Kulefsky said that his attempts to speak with both Ramapo Police Chief Brad Wiedel and the district attorney’s office have yielded no results. Efforts by VIN News to reach the Ramapo Police Department, the Peekskill Police Department and the Rockland County District Attorney’s office produced no immediate results. Misrepresentations in the case by Ramapo police are all part of an effort to protect a fellow officer, charged Kulefsky. “We all know that if he wasn’t a cop, Mosquera would have been in jail immediately,” said Kulefsky. of course they do, they always cover each other. Actually Rockland prosecutor Zugibe gives away Get out of Jail free cards all the time to the local frum. what boggles the mind is that they ticketed the bochur that was pulling into the driveway! the guy that was CUT OFF by this cop! why?! Can you post a copy of the report. I would like to read it for myself.